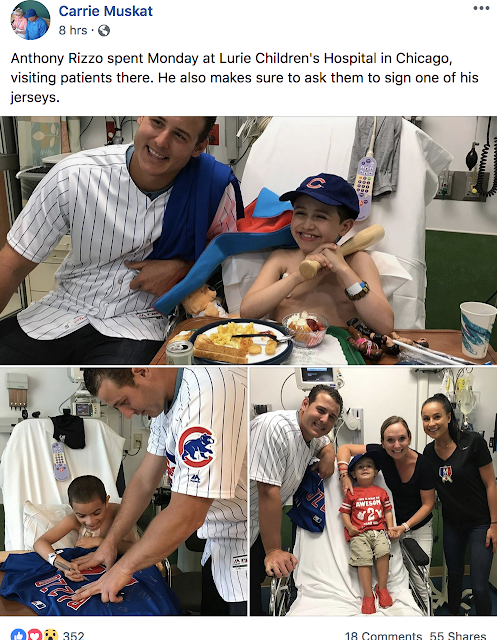 #44 Anthony Rizzo is all that's right with the world. He began the day visiting pediatric cancer patients. At the hospital where, last year, he gifted a family waiting room. Then tonight he became the happiest relief pitcher in the history of the game. Watch the clip and see a man's dream come true He's always wanted to pitch in a major league game. Look at that the joy on that face! I had been sad. Now I am not. Because of Rizz. I saw Caleb and Napoleon today. The news is sad. They visited Randi over the weekend at the Mayo Clinic. The doctors finally isolated her problem: she has been ill and not getting well because of her pancreas. But I could tell by what Caleb was saying -- and not saying -- that it's very serious. Is it pancreatitis? Pancreatic cancer? I don't know. But he is very worried. When she is well enough to travel, they are going to relocate to a rehab facility "just outside Chicago." The two towns he mentioned are both 45 mins. to an hour outside of Chicago. That's by car. They don't have a car. I don't know how he can navigate it between her rehab in the burbs and his job in the city, day in/day out. He looks terribly thin. Obviously he's not eating. Is it lack of funds? Lack of appetite because he's so worried about his wife? Or is his tooth still bothering him? I didn't ask. Instead I lightened the mood by mentioning the library book sale. I told him I would grab him as many books by his favorite authors as I can. He requested James Rollins, James Patterson (but not Alex Cross), The Girl in the Spider's Web, and athlete's memoirs. He wants to start reading athlete's memoirs. Napoleon, however, is fine. I lent Caleb my phone and I watched the cat as he called his friend. Napoleon deigned to let me pet him. He's strong and healthy (and bored by me).